MAXAM’s initiation systems feature many advanced products, from seismic, electronic, and non-electric detonators, to traditional goods, such as detonating cord and electric detonators. The company is constantly reassessing and re-evaluating its products to ensure their clients can benefit from some of the safest, most reliable and convenient offerings on the market. MAXAM manufactures a full line of initiation systems, which includes safety fuse, RIOCORD detonating cord, RIODET electric detonators, RIOTRONIC electronic detonators, and RIONEL non-electric detonators. In addition, MAXAM´s packaged explosives are designed to offer the best solutions in a global range of customer´s necessities. These include dynamites, emulsion and watergel products. These constitute the wider portfolio family of packaged explosives for an array of blasting applications. MAXAM provides a comprehensive range of bulk products. RIOFLEX, RIOMEX, RIOXAM and RIOFRAG offer efficient, effective, and safe solutions to customers worldwide. These are used mainly where large quantities of explosives are applied and have to be expediently delivered, such as large open pit mines. A key differentiator is that MAXAM also makes these bulk products available in underground mining operations. Key advantages include high-energy, a full range of densities, and excellent water-resistance. 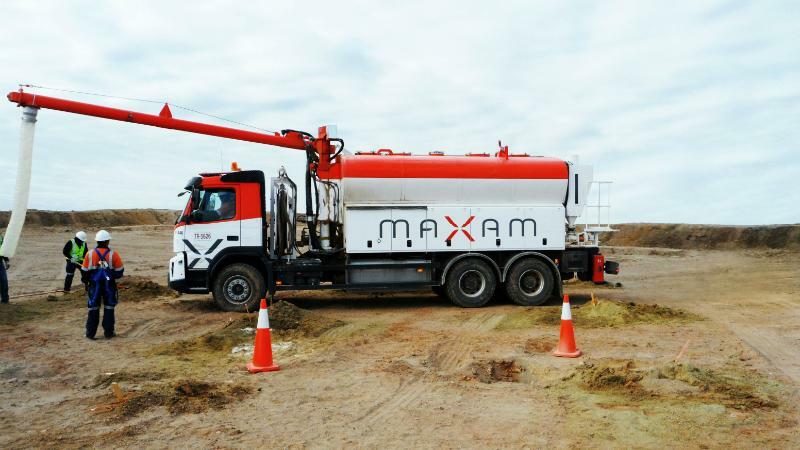 MAXAM creates and customises manufacturing and special delivery equipment, such as explosives manufacturing plants, bulk trucks and pumping systems to meet on-site set up requirements for large mining and construction projects. This includes designing technology for surface, underground, maritime and seismic loading equipment. There is a high emphasis on safety and reliability of supply, often to meet difficult conditions and access remote mining environments. Both in the design and implementation of projects, health and safety is of paramount importance, and a crucial aspect in the internal management of all projects, as laid out in the guidelines of the company’s corporate policy. MAXAM offers a full line of measurements and solutions to help customers reduce their total costs of ownership (TCO). With nearly 40 services and solutions, the company helps solve a variety of technical or operational problems, while focusing on optimising customers’ TCOs. MAXAM´s RIOBLAST design, simulation and analysis software consists of several modules that deal with land mapping, blast geometry and loading, blast timing and sequencing, vibration, fragmentation, and flyrock predictions. In addition, RIOBLAST aids in the determination of environmental and safety parameters, and can provide full control over the scheduling of drilling and blasting operations to optimise the total drilling and blasting process. MAXAM´s solutions are clearly aimed at working with customers to improve their drilling and blasting operations and to reduce their TCOs by also quantifying downstream benefits. MAXAM´s technical applications team (TAP) channels the full range of products into a series of services, and applications into its RIOBLAST software for designing blasts. The web-enabled RIOCLOUD can provide a full record of the evolution of the key performance indicators (KPIs) of an entire project, where MAXAM works with its customers to achieve the best results in mine-to-mill and rock-on-ground solutions, blast design, and predictive modelling. Measurements of the variables of the entire blast (vibration, granulometry, floor and wall stability, inert material generated) training, audit, and forensic investigation are also provided. A range of solutions to meet the specific needs of any project, no matter the size, geographical location or characteristics, such as temperature (from -40º in Siberia to 40º in the Amazon), environment (such as the Atacama desert in Chile), underwater (such as the expansion of the Panama canal, the Aswan dam in Egypt, or the port of Santos in Brazil), or any other areas, as well as special blasts, are available from MAXAM’s Field Application Group. Originally founded in 1872 as one of Alfred Nobel´s early companies, MAXAM manufactures a full line of explosives products, including initiation systems, packaged products, and bulk products, as well as offers a multitude of blasting related solutions; most linked to its proprietary RIOBLAST software. MAXAM operates facilities in 45 countries, and supplies customers in more than 100 countries with nearly 6,500 employees.